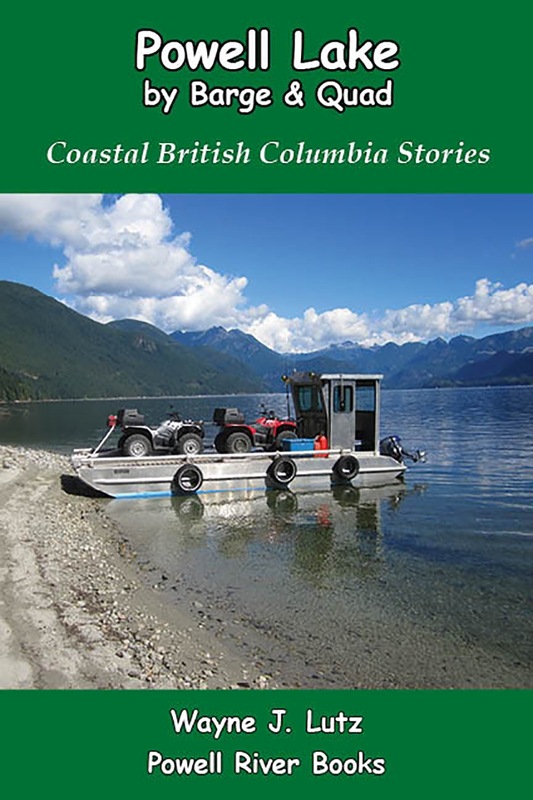 I've already shared the Tin Boat once before, but it's such an important part of our life up the lake that I wanted to take you on a little joy ride. Some days our lake is calm and smooth. On others, it's a bit "lumpy" as breezes move back and forth. 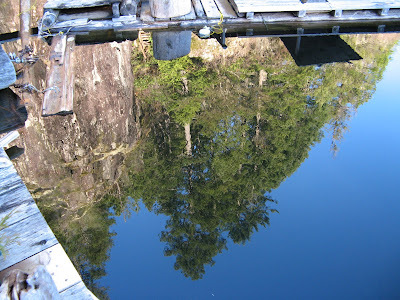 This day, it was smooth and calm back by our cabin in Hole in the Wall, but out in the Narrows it was a lumpy day. Cedar logs were lashed together to create a float. Because dirt is heavy, several 55 gallon blue barrels were placed underneath and filled with air to provide extra buoyancy. Then four raised beds were constructed and placed on top. Each bed is four feet wide and ten feet long. Because we live in Coastal BC, our winters are fairly mild. My strawberries, asparagus, and herbs survive through the winter. Here's my garden in early spring. My daffodils are sprouting, and Mr. Bunny is happy the chard and kale are still producing. Summer is prime time. Even though space is limited, I have potatoes, onions, carrots, beets, radishes, spinach, zucchini, peas, beans, and lettuce in addition to my annuals. Each year I rotate my crops and replenish the soil, but I have to be careful to protect the water on which the garden floats. It also serves as our drinking water. Last Thursday I shared a fishing vessel called Native Sun that I found in the Blaine Harbor. The skies were blue with white puffy clouds. A rare thing lately. 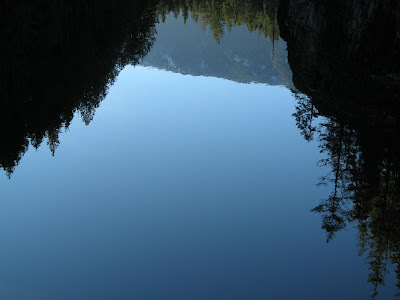 There was no wind, so the water was mirror smooth. So here's the Native Sun times two. In the middle of Harrison Hot Springs there's a shoreline park with paths for walking, benches for relaxing, sand for sunning (hopefully soon), and lake views for enjoying. In a rock garden, I found this salmon sculpture that looked of sand. The harbor in Blaine, Washington, has a mix of private craft and working boats. At a commercial pier, I found the Native Sun. She's a skookum fishing boat that makes me think of the Iron Maiden I found in Steveston, BC. But the Native Sun is bigger with a hull meant for open seas. I went online to find out more about the Native Sun. I found her on the U.S. Coast Guard website. She's an 81.2 foot steel hulled fishing vessel built in 1979 by Master Marine, Inc. Her owner is in Ferndale, so it's logical to find her moored in Blaine. The term primeval forest refers to old growth or primary growth forests, but those are rare along the British Columbia coast where logging has been a prominent part of the economy for over a century. But, there are many forests now reaching their 100th birthday and are a sight to behold. There are also a few true old growth trees interspersed among those forests that give us a hint of what it was like in the beginning. An old growth forest includes large living trees, standing dead trees or snags, and fallen logs in various stages of decay. Under the forest canopy you will a wide variety of plants. The carbon-rich soil from the decaying logs provides fertile ground for mosses. fungi and other shade lovers. 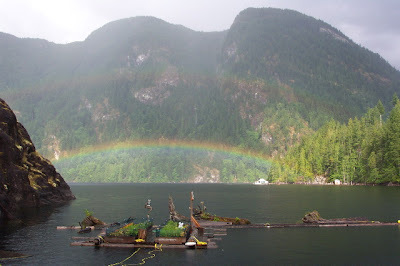 Frequent precipitation and humidity in the coastal rainforest adds to the profusion of plant and animal life. One end of the village is anchored by the luxurious Harrison Hot Springs Resort and Spa. I walked down and lots of people were enjoying their spa experience and walking around in fluffy white robes. I chose to stay in the less pretentious (and expensive) Spa Motel. That's it with the red roof on the left. It was 50's style, but the room was clean and fresh. I would go back. The weather was overcast with sprinkles for my whole stay, but that didn't stop me from walking the village from end to end. Even this time of year, there were lots of restaurants and shops open. After checking my options, I chose the Old Settler Pub. The settler may have been old, but the pub is new log construction. I love pubs. It was prawn night, a dozen in garlic butter for $4.99. I added wings, a salad, and Sleeman's Honey Brown for a special treat. There are days in Hole in the Wall when the winds blow at gale force. 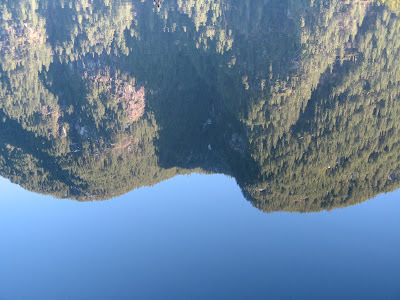 In January 2007 the winds were so bad they blew down hundreds if not thousands of trees around Powell Lake. The Hole in the Wall wasn't spared. The trees in John's back bay were uprooted and leveled. Living up the lake, we spend lots of time watching the birds that come to visit. 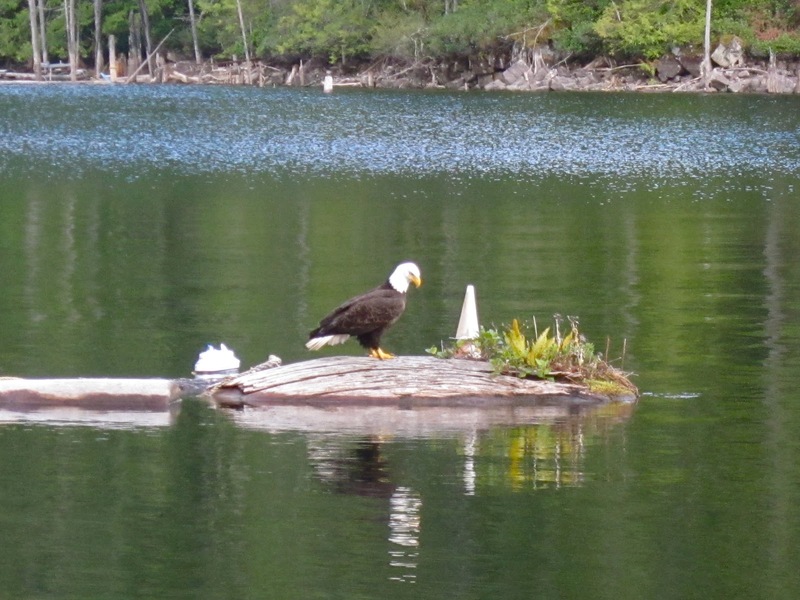 One day last spring, a Bald Eagle landed on one of our floating stumps. What a photographic opportunity. And he stayed quite a while letting us view him through the front sliding glass door. Thursday was a day off for me. 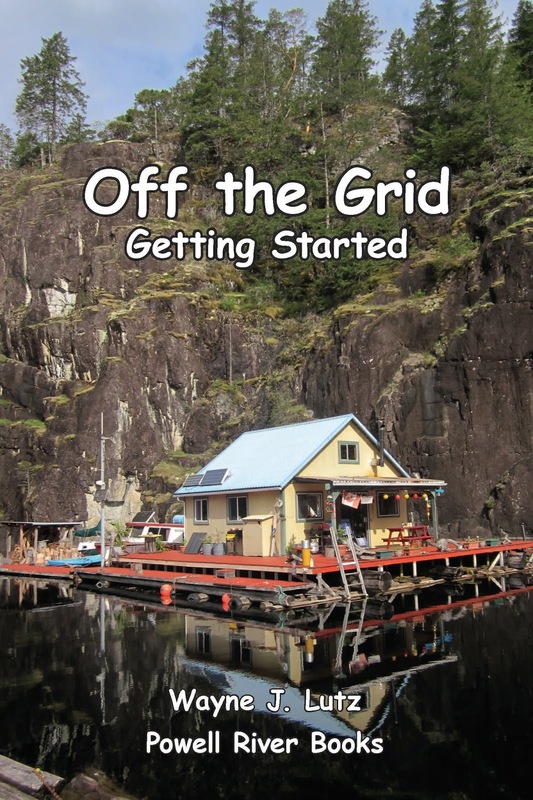 I took Wayne to the Vancouver Boat Show for Off the Grid presentations then took my time getting back to Bellingham. My first stop was the Peace Arch International Park, a free zone between the Canadian and U.S. border crossings. After clearing customs, I stopped in Blaine, Washington. After strolling around the marina and looking at boats, I got hungry. I drove down Blaine's main drag, aptly named Peace Arch Portal Way, and found a cute little cafe in a remodeled caboose. 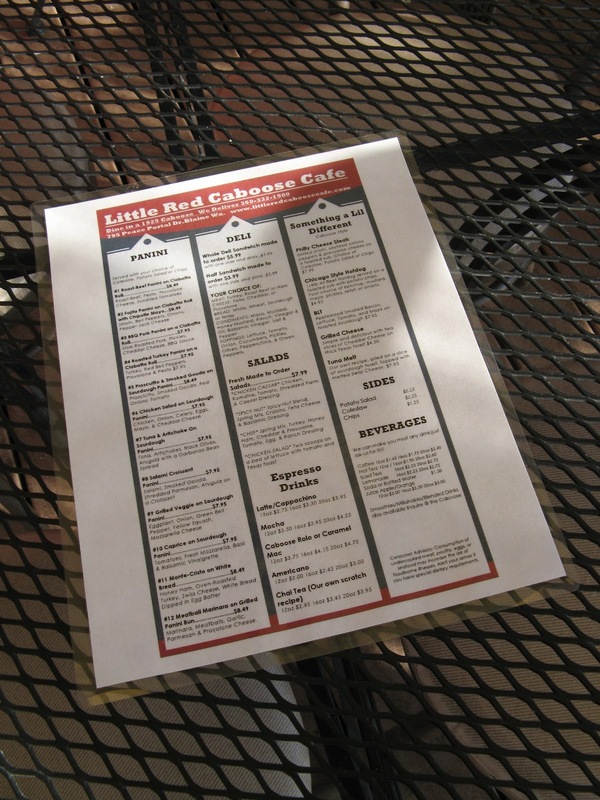 Not only is the Little Red Caboose Cafe cute, it has great food. It's family owned by Dave and Susan Smith. They are open for breakfast with traditional combos and early morning sandwiches, and lunch with sandwiches (including Philly cheese steak) and salads. Or just stop by for a latte inside or on the patio. I opted for a wrap. Sorry, I was so hungry I took a bite before taking the picture. But that lets you see how good it looks inside and out. I love trains. I love good food. I can't think of a better way to combine both into a fantastic treat. On February 11, 2008, Wayne and I immigrated to Canada. We passed this very spot in Peace Arch International Park to meet with a Canadian immigration officer at the border crossing. I can only speak for myself, but I know Wayne has similar feelings. 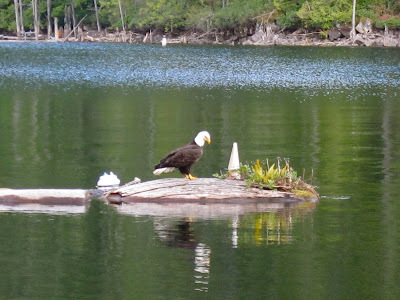 We love our adopted country and home in Powell River, BC. "Children of a Common Mother." I've always felt that about Canada and the States. I was born and raised in Southern California, but both sides of my family came to the U.S. via Canada. My father's family immigrated from England and settled near Montreal. My great grandfather on my mother's side came through Montreal from Ireland during the potato famine. However, both families chose to move to the States, and ultimately to Southern California. I guess that was a good thing for me. I've always felt moving to Canada was like coming home. Many summers my mom and dad would bring me to British Columbia camping. I may have even passed through Powell River way back then. 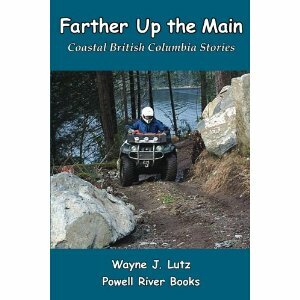 But when Wayne and I landed our Piper Arrow at the Powell River Airport back in 2000, we both knew we'd found home. This week I took a mini-trip to nearby Blaine, Washington. After crossing the border heading south at the Peace Arch, I took the first exit onto Peace Portal Drive. Blaine is a small border town with lots of character. At the traffic circle, I went right on Marine Drive to head down to the marina. Here there are paths, benches, tables, a place perfect for strolling and relaxing and boat watching on a semi-sunny winter day. As I passed this pier and crane, I was only looking at the beautiful view. I pass through the joint US and Canadian Peace Arch International Park heading north and south from my Powell River home to visit my mother in Bellingham south of the border. Every time I'm reminded that I have my feet firmly planted in two countries. The United States is my birth country. And that's where I was headed yesterday, passing the Peace Arch monument. Canada is my adopted country and I love living here. On the Canadian side, the monument's motto is "Brethren Dwelling Together in Unity." The water in Powell Lake is high after winter rains and the water level is up and rising higher with each storm. Sticks, twigs, branches and whole logs have been washed from the shore and are floating in profusion all over the lake. The Hole in the Wall seems to attract this floating debris field. It will enter early in the morning and then float back out later in the day. Some of the debris gets caught behind our log booms. We haul out stove-size chunks, kindling and small, thin logs that can be cut up to burn. 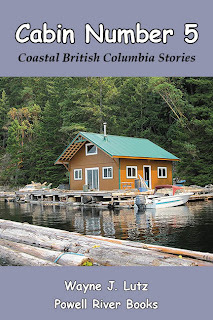 The large logs we encourage to leave to find a shoreline home elsewhere. Our float cabin is off the grid. You can live simply, or with lots of modern innovations. For hot water, many people have chosen tankless hot water heaters run by electricity (solar or generator) or propane. 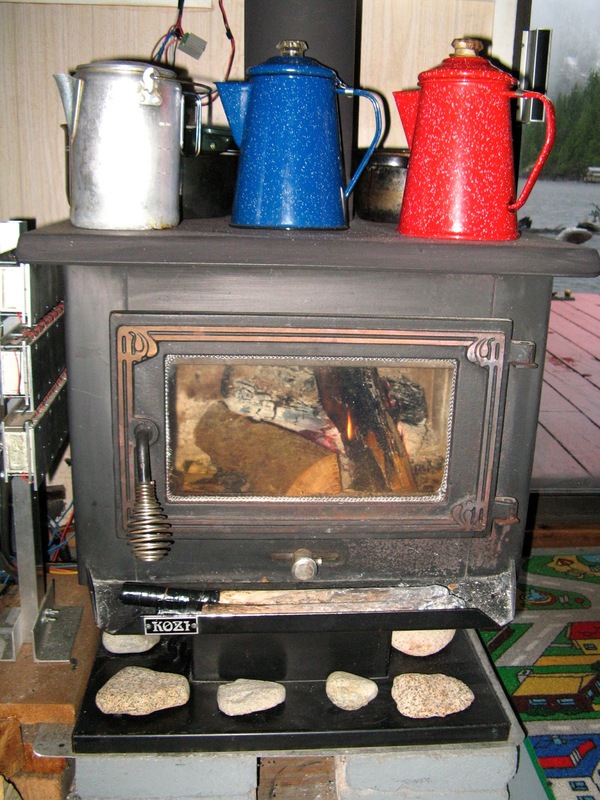 There are also wood stoves that generate hot water. You can make your own, or purchase one with that feature built in. Wayne and I have chosen to adopt a simpler solution. We like to have hot water for cooking, washing dishes, cleaning, and winter tub baths (lake water is just fine in summer). We use pots and pans on top of the wood stove to heat water. From October to May, we have daily fires. In the middle of winter, they last all day. You can heat a lot of water in that amount of time. On bath day, four large pots on top of the wood stove will give us enough hot water for a bath in our regular size tub in our new bathroom. 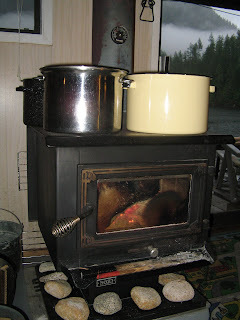 Plus the extra heat needed to get it boiling warms up the cabin for when we are done. Every season has it's own beauty. Quad riding in the bush during winter can be a wet, messy experience.